DEADLINE EXTENDED until Friday, Dec. 22! You’re in luck! 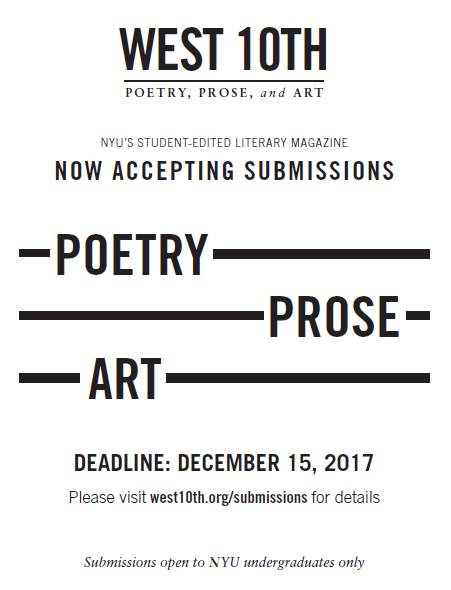 West 10th, NYU’s undergraduate creative writing journal, is now accepting submissions for its 2017-2018 issue until December 22, 2017. We figured you were all so busy with finals that it cut down on your editing time, so we’ve got you covered! Perfect those pieces, add the last finishing touches, and send them over! Let the world see what you’ve been working on all semester. Ready to submit now? Check out the submissions guidelines on our website. We can’t wait to read your work. Submit your work to West 10th! Attention NYU undergrads! The deadline to submit your poetry, prose, and art to West 10th‘s 2017-2018 issue is on FRIDAY, DECEMBER 15! To learn more about what we are looking for, click HERE.